The Board of The BetMakers Holdings Limited (ASX:TBH) (OTCMKTS:TPBTF) advises that in November 2016 two of the shareholders of Punters Show Pty Ltd commenced proceedings against the BetMakers and others. 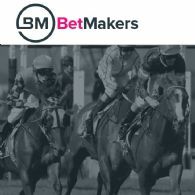 The Betmakers Holdings Limited (ASX:TBH) (OTCMKTS:TPBTF) provides the Company&apos;s FY19 Half Year Financial Report. The Board of The BetMakers Holdings Limited (ASX:TBH) (OTCMKTS:TPBTF) is pleased to provide the following overview on the quarterly activities for the period ending 31st December 2018 in respect of the Company and its subsidiaries. 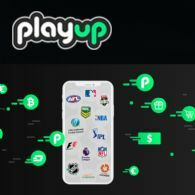 PlayUp Ltd has paid in full $6 million for the acquisition of the TopBetta Pty Ltd including TopBetta and MadBookie brands. The Board of The BetMakers Holdings Limited (ASX:TBH) (OTCMKTS:TPBTF) is pleased to confirm that it has received the final payment of $1 Million from PlayUp Australia Pty Limited for the purchase of TopBetta Pty Ltd and associated brands, including TopBetta and Mad Bookie. The Board of The BetMakers Holdings Limited (ASX:TBH) (OTCMKTS:TPBTF) wishes to update the market in relation to the sale of TopBetta Pty Ltd and the associated TopBetta and MadBookie retail brands to PlayUp Australia Pty Limited. The BetMakers Holdings Limited (ASX:TBH) (OTCMKTS:TPBTF) advises today that it has not received the final payment of $2Mil from PlayUp Australia Pty Limted in relation to the sale of 100% of the shares in TopBetta Pty Ltd and the associated TopBetta and MadBookie retail brands, which was due on 31 December 2018. The Board of The BetMakers Holdings Limited (ASX:TBH) (FRA:T07) (OTCMKTS:TPBTF) is pleased to update the market, in relation to the purchase of the Dynamic Odds (DO) business. The BetMakers Holdings Limited (ASX:TBH) is pleased to announce that its wholly-owned subsidiary, Global Betting Services Pty Ltd, has signed an agreement with Unibet, to provide a global racing solution for Unibet&apos;s global platforms. The BetMakers Holdings Limited (ASX:TBH) is pleased to announce that its wholly-owned subsidiary, Global Betting Services Pty Ltd ("GBS"), has extended and upgraded its Agreement with Australian wagering operator BetEasy Pty Ltd for a further 3 years. The Betmakers Holdings Limited (ASX:TBH) (OTCMKTS:TPBTF) provides the Company&apos;s latest Investor Presentation. The Betmakers Holdings Limited (ASX:TBH) (OTCMKTS:TPBTF) provides the Company&apos;s CEO Address to AGM. The BetMakers Holdings Limited (ASX:TBH) (OTCMKTS:TPBTF) is pleased to announce that its wholly-owned subsidiary, Global Betting Services Pty Ltd, has signed an agreement with WHG to provide a global racing solution for William Hill UK, both retail and online and its B2B customers throughout the UK and US. The WHG Agreement is expected to have a material economic impact on the Company. The Board of The BetMakers Holdings Limited (ASX:TBH) (OTCMKTS:TPBTF) is pleased to announce two new senior management appointments. The Board of The BetMakers Holdings Limited (ASX:TBH) (OTCMKTS:TPBTF) is pleased to provide the following overview on the quarterly activities for the period ending 30th September 2018. The Board of The BetMakers Holdings Limited (ASX:TBH) (OTCMKTS:TPBTF) is pleased to announce that, today, Neds.com.au (a Northern Territory licensed operator), has received written correspondence from the Northern Territory Racing Commission in relation to the proposed agreement with The Global Tote (a wholly owned subsidiary of BetMakers). The Board of The BetMakers Holdings Limited (ASX:TBH) (OTCMKTS:TPBTF) would like to provide an update in respect of the sale of 100% of the shares in TopBetta Pty Ltd and the associated TopBetta and MadBookie retail brands, to PlayUp Australia Pty Limited, along with the expansion of services into the US market between BetMakers, PlayUp and the Global Tote. The BetMakers Holdings Limited (ASX:TBH) (OTCMKTS:TPBTF) today announced that its wholly owned subsidiary BetMakers DNA Pty Ltd has signed an agreement with wagering platform provider, InPlayNet Entertainment Limited www.inplaynet.com to provide the full racing solution including Global Tote access for their clients. The Board of The BetMakers Holdings Limited (ASX:TBH)(OTCMKTS:TPBTF) is pleased to announce that yesterday, 17 September 2018, its wholly-owned subsidiary, BetMakers DNA Pty Ltd took ownership of 100% of the shares in global wagering service provider, Global Betting Services Pty Ltd. The Board of The BetMakers Holdings Limited (ASX:TBH) (OTCMKTS:TPBTF) is pleased to announce that the second tranche of the shortfall placement from the Company&apos;s recent entitlement offer has been completed. The Board of The BetMakers Holdings Limited (ASX:TBH) (OTCMKTS:TPBTF) is pleased to announce that on 31 August 2018, it completed the acquisition of DynamicOdds Pty Ltd and C.D.K Software Limited, and took 100% ownership of the DynamicOdds business. 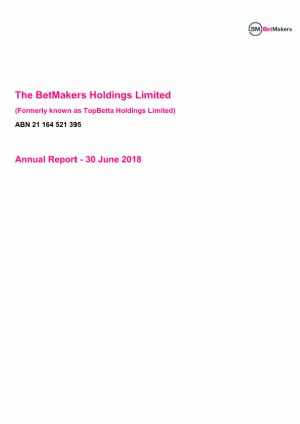 The directors present their report, together with the financial statements, on the consolidated entity consisting of The BetMakers Holdings Limited (ASX:TBH) (OTCMKTS:TPBTF) and the entities it controlled at the end of, or during, the year ended 30 June 2018. 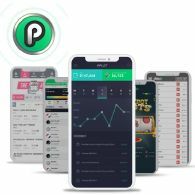 PlayChip, the Universal Gaming Token, is cementing its status as one of the most promising token sales of 2018. The PlayChip Foundation, whose token is in pre-sale until October 31, today announced that its combined user count has hit 1 million, a milestone they had initially forecasted surpassing in December. The Board of The BetMakers Holdings Limited (ASX:TBH) (OTCMKTS:TPBTF) is pleased to provide an update on the more terms regarding the acquisition of Global Betting Services Pty Ltd. The BetMakers Holdings Limited (ASX:TBH) (OTCMKTS:TPBTF) is pleased to announce that wagering operators, Ladbrokes Digital Australia Pty Ltd and Neds.com.au Pty Ltd have upgraded and extended their contracts with Global Betting Services Pty Ltd. The Board of The BetMakers Holdings Limited (ASX:TBH) (OTCMKTS:TPBTF) is pleased to announce that its wholly owned subsidiary, BetMakers DNA Pty Ltd has signed a second US greyhound racing track, Jacksonville Greyhound Racing Inc. trading as bestbet Jacksonville to distribute data and vision. The Board of The BetMakers Holdings Group Limited (ASX:TBH) (OTCMKTS:TPBTF) is pleased to announce that it has placed, or received firm commitments for, an additional $3.0 million worth of shares from new and existing investors, taking the total amount raised from the recent entitlement offer to $4.5 million. 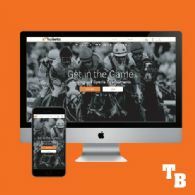 The Board of The Betmakers Holdings Limited (ASX:TBH) (OTCMKTS:TPBTF) wishes to announce the completion of the retail component of the accelerated non-renounceable pro-rata entitlement offer of fully paid ordinary shares in TBH to raise approximately $6.7 million (before costs of the offer). The Board of The BetMakers Holdings Limited (ASX:TBH) (OTCMKTS:TPBTF) is pleased to announce that its wholly owned subsidiary, BetMakers DNA Pty Ltd, has signed a data and vision distribution deal with one of the USA&apos;s most prominent greyhound racing tracks, Palm Beach Kennel Club. 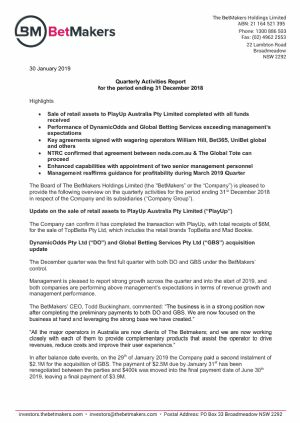 The Board of The BetMakers Holdings Limited (ASX:TBH) (OTCMKTS:TPBTF) is pleased to provide an update regarding the acquisition of DynamicOdds Pty Ltd.
PlayUp Limited has announced it has signed an agreement to acquire 123gaming Limited. 123gaming was founded in New Zealand in 2006 and today is a multi-award winning gaming company based in the UK & USA. The business is licensed in numerous states in the USA including a license in Washington State. The Betmakers Holdings Limited (ASX:TBH) (OTCMKTS:TPBTF) refers to the offer document released to the ASX on 24 July 2018 relating to the retail component of the accelerated non-renounceable pro-rata entitlement offer of fully paid ordinary shares in TBH to raise approximately $6.7 million (before costs of the offer). The Board of The BetMakers Holdings Limited (ASX:TBH) (OTCMKTS:TPBTF) is pleased to provide the following overview on the activities for the quarter ending 30 June 2018. On Friday, 20 July 2018, The Betmakers Holdings Limited (ASX:TBH) (OTCMKTS:TPBTF) announced an accelerated non-renounceable entitlement offer of fully paid ordinary shares in TBH to raise approximately $6.7 million (before costs of the offer). The Offer includes an institutional component and a retail component. 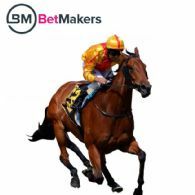 The BetMakers Holdings Limited (ASX:TBH) (OTCMKTS:TPBTF) is pleased to announce an accelerated nonrenounceable entitlement offer. The BetMakers Holdings Limited (ASX:TBH) (OTCMKTS:TPBTF) is pleased to announce that its newly incorporated subsidiary, BetMakers DNA Pty Ltd, has agreed to acquire 100% of the shares in the parent company of Global Betting Services Pty Ltd for a total purchase price of $10 Million payable in cash and/or fully paid ordinary shares in the Company. Further to the announcements released on 18 April 2018 and 23 April 2018, The BetMakers Holdings Limited (ASX:TBH) (formally TopBetta Holdings Limited) is pleased to announce that it has completed the sale to PlayUp Australia Pty Limited of 100% of the shares in the Company&apos;s wholly-owned subsidiary, TopBetta Pty Ltd, and the associated retail assets, TopBetta and Mad Bookie. 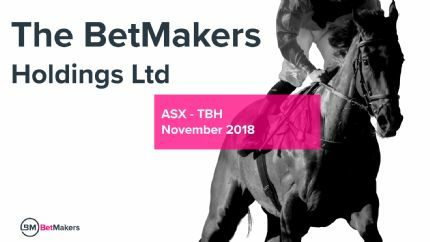 The Betmakers Holdings Limited (ASX:TBH), formerly TopBetta Holdings Limited, is pleased to advise that the change of Company name approved by shareholders at the general meeting of the Company held on 18 June 2018 has been completed and the Australian Securities and Investments Commission has recorded the change of Company name. At the General Meeting of shareholders of TopBetta Holdings Limited (ASX:TBH) to be held today, Monday, 18 November 2018, TBH is asking shareholders to pass a resolution for the purposes of ASX Listing Rule 7.4, to ratify the issue of 3,508,771 shares that were issued pursuant to a placement announced on 26 February 2018. TopBetta Holdings Limited (ASX:TBH) is pleased to announce that it has entered into a binding, conditional heads of agreement to acquire 100% of the shares in data and betting tools company, DynamicOdds Pty Ltd, and its associated licensing brands. Topbetta Holdings Ltd (ASX:TBH) provides the Company&apos;s latest Investor Presentation. The Board of TopBetta Holdings Limited (ASX:TBH) is pleased to provide shareholders with an overview on the quarterly activities for the period ending 31 March 2018. 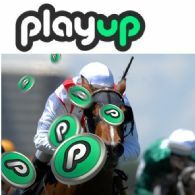 PlayUp Limited has entered into a binding, conditional heads of agreement to acquire the retail bookmaking subsidiary of Sydney-based TopBetta Holdings Limited (ASX:TBH) which includes the well-regarded &apos;TopBetta&apos; and &apos;Mad Bookie&apos; brands. The Board of TopBetta Holdings Limited (ASX:TBH) is pleased to provide the market with an update regarding the proposed sale of TopBetta Pty Ltd to PlayUp Limited ("PlayUp") as announced on 18 April 2018. The Board of TopBetta Holdings Limited (ASX:TBH) is pleased to update the market with the following announcement about its retail wagering and wholesale businesses. The securities of Topbetta Holdings Ltd (ASX:TBH) will be placed in Trading Halt Session State at the request of the Company, pending the release of an announcement by the Company. Further to the ASX announcement dated 19th February 2018, the Board of TopBetta Holdings Limited (ASX:TBH) is pleased to announce that the Company has completed the issue and allotment of 3,508,771 fully paid ordinary shares to raise AUD$1M at 28.5 cents per Placement Share from sophisticated and institutional investors. The Board of TopBetta Holdings Limited (ASX:TBH) is pleased to announce that the Company has received firm commitments to subscribe for 3,508,771 fully paid ordinary shares to raise AUD$1M at 28.5 cents per Placement Share from sophisticated and institutional investors. The Board of TopBetta Holdings Limited (ASX:TBH) is pleased to provide shareholders with an overview of the Company&apos;s activities for the quarter ending 31 December 2017. The Board of TopBetta Holdings Limited (ASX:TBH) is pleased to update the market on a new commercial deal for the Australian wholesale division of the company&apos;s wholly-owned UK-based subsidiary The Global Tote Ltd. The Board of TopBetta Holdings Limited (ASX:TBH) is pleased to update the market on the successful completion of technical integration pursuant to the agreement between The Global Tote Ltd, the Company&apos;s wholly-owned Alderney-based subsidiary, and Ladbrokes Australia. The Board of TopBetta Holdings Limited (ASX:TBH) is pleased to provide an update on the Company&apos;s activities for the quarter ended 31 December 2017. The Board of TopBetta Holdings Limited (ASX:TBH) is pleased to announce that its wholly-owned Alderney-based subsidiary, The Global Tote Limited ("The Global Tote"), has signed a deal that will allow US punters to access its pools on Australian racing for the first time. The Board of TopBetta Holdings Limited (ASX:TBH) is pleased to announce that its wholly-owned Alderney-based subsidiary, The Global Tote Ltd, has entered into an agreement with the Official UK Totepool, Totepool Alderney Limited, to give it the ability to distribute its pools through 10,000 plus UK and European betting shops and some of the world&apos;s top global wagering websites. The Board of TopBetta Holdings Limited (ASX:TBH) is pleased to announce that its wholly-owned subsidiary, The Global Tote Ltd, has entered into an agreement to provide its services to Australian online bookmaker Neds.com.au in relation to racing and sporting events over the course of the 2018 calendar year. Topbetta Holdings Ltd (ASX:TBH) provides the Company&apos;s CEO Speech at Annual General Meeting. As TopBetta Holdings Limited (ASX:TBH) continues to grow its retail and wholesale divisions, the Board of TopBetta is pleased to provide the following update on the Company&apos;s activities for the quarter ended 30 September 2017. Further to the announcement dated 9 October 2017, the Board of TopBetta Holdings Limited (ASX:TBH) is pleased to announce that it has completed the acquisition of the code base of the Global Tote product from Modern Wagering Systems Pty Ltd on the terms set out in the Announcement. The Board of TopBetta Holdings Limited (ASX:TBH) is pleased to announce that it has completed contract negotiations with Modern Wagering Systems to secure the code base of the Global Tote product. The Board of TopBetta Holdings Limited (ASX:TBH) is pleased to provide shareholders with highlights of its strong growth in turnover, revenue and Active User numbers for the quarter ending 30 September 2017. The Board of TopBetta Holdings Limited (ASX:TBH) wishes to address the article published in The Australian newspaper on 9 September 2017 which made reference to TopBetta. The Company has received several queries from investors this morning in relation to the Article and accordingly, the Board considered it prudent to respond to such queries via the ASX platform. Further to the announcement on the 23rd August 2017, the Board of TopBetta Holdings Limited (ASX:TBH) is pleased to announce that it has completed the issue and allotment of 21,445,681 fully paid ordinary shares to raise AUD $9,007,186.02 at 42 cents per share from sophisticated and institutional investors. The Board of TopBetta Holdings Limited (ASX:TBH) is pleased to announce that the Company has received firm commitments to raise approximately $9M at 42 cents per fully paid ordinary share from sophisticated and institutional investors. The directors present their report, together with the financial statements, on the consolidated entity consisting of TopBetta Holdings Limited (ASX:TBH) and the entities it controlled at the end of, or during, the year ended 30 June 2017. Topbetta Holdings Ltd (ASX:TBH) and The Global Tote Licensed to Operate in the U.S. The Board of TopBetta Holdings Limited (ASX:TBH) is pleased to announce that each of The Global Tote Ltd and TopBetta Pty Ltd has been granted a licence to operate in the US market. The Board of TopBetta Holdings Limited (ASX:TBH) is pleased to announce that it has received its licence from the UK Gambling Commission for both TopBetta Pty Ltd and its wholly-owned subsidiary The Global Tote Ltd. The Board of TopBetta Holdings Limited (ASX:TBH) is pleased to provide shareholders with an overview of the quarterly activities for the quarter ending 30 June 2017. Further to the Announcement released earlier today, the Board of TopBetta Holdings Limited (ASX:TBH) wishes to advise that, due to an administrative error, the total number of shares to be issued under the Share Purchase Plan as previously announced did not correctly reflect the entitlements of the beneficial holders who applied for SPP shares via custodians. Further to the Announcement dated 21 June 2017, the Board of TopBetta Holdings Limited (ASX:TBH) is pleased to confirm the completion of the issue and allotment of the shares under the Share Purchase Plan. The Board of TopBetta Holdings Limited (ASX:TBH) is pleased to announce the results of its Share Purchase Plan offer which closed at 5.00pm (AEDT) on 16 June 2017. 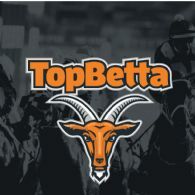 TopBetta Holdings Ltd (ASX:TBH) is pleased to announce it has secured a commitment from one of Australia&apos;s top punters to bet an estimated $AUS200 million into The Global Tote pools available via the Company&apos;s &apos;TopBetta&apos; platform over the next 12 months. 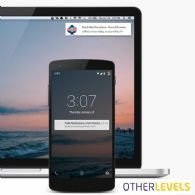 OtherLevels Holdings Limited (ASX:OLV) ("OtherLevels") is pleased to announce that Australian on-line wagering and the world&apos;s first social betting platform operator TopBetta has selected OtherLevels. The Board of TopBetta Holdings Limited (ASX:TBH) is pleased to announce that it has completed the transaction with Modern Wagering Systems Pty Ltd and Live Datacast Pty Ltd pursuant to which the Company&apos;s wholly owned subsidiary, The Global Tote Limited, has (amongst other things) been granted exclusive rights to the software underpinning The Global Tote technology. Further to the announcement on 11 May 2017, the Board of TopBetta Holdings Limited (ASX:TBH) is pleased to announce that it has completed the issue and allotment of 9,375,000 fully paid ordinary shares to raise $1.5 million at 16 cents per share from sophisticated and institutional investors. The Board of TopBetta Holdings Limited (ASX:TBH) is pleased to announce that it has received firm commitments to raise $1.5M (before costs) at 16 cents per share from sophisticated and institutional investors. In addition, the Company is pleased to provide investors with an update on the international wholesale tote product The Global Tote. Topbetta Holdings Ltd (ASX:TBH) is pleased to provide the following update on The Global Tote Limited, TopBetta&apos;s Alderney-based subsidiary. Topbetta Holdings Ltd (ASX:TBH) is pleased to advise that the recently announced acquisition of Australian racing and sports wagering company, Mad Bookie Pty Ltd. by TopBetta Pty Ltd has now been completed. The Board of TopBetta Holdings Limited (ASX:TBH) is pleased to provide the following update on the Company&apos;s activities for the quarter ended 31 March 2017. Topbetta Holdings Ltd (ASX:TBH) is pleased to announce that its subsidiary, TopBetta Pty Ltd has entered into an agreement to acquire the assets of Melbourne-based racing and sports wagering company, Mad Bookie Pty Ltd. The Board of TopBetta Holdings Limited (ASX:TBH) is pleased to provide investors with an update on the progress of the Company&apos;s Alderney-based subsidiary, The Global Tote Limited. The Board of TopBetta Holdings Limited (ASX:TBH) is pleased to announce that the Northern Territory Racing Commission have approved a revised agreement between TopBetta Pty Ltd and Global Tote Ltd.
Topbetta Holdings Ltd (ASX:TBH) would like to update the market on the launch of The Global Tote technology platform developed by its Alderney-based subsidiary, The Global Tote Ltd.
Topbetta Holdings Ltd (ASX:TBH) is pleased to provide the Company&apos;s latest Investor Presentation. 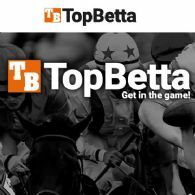 Topbetta Holdings Ltd (ASX:TBH) is excited to announce that its subsidiary, The Global Tote Limited, will launch its world-first pooled wagering system, The Global Tote. The Board of TopBetta Holdings Limited (ASX:TBH) ("TopBetta" or the "Company") is pleased to provide the following update on the Company&apos;s activities for the quarter ended 31 December 2016. Topbetta Holdings Ltd (ASX:TBH) is pleased to announce that it has entered into a binding, conditional Heads of Agreement with Australian wagering technology company, Modern Wagering Systems Pty Ltd and Live Datacast Pty Limited pursuant to which the rights to The Global Tote technology will be assigned, or exclusively licensed, to TopBetta&apos;s wholly owned subsidiary, The Global Tote Limited. Topbetta Holdings Ltd (ASX:TBH) is pleased to announce that corporate bookmaker Ladbrokes.com.au, the Australian subsidiary for the UK parent and world wagering leader Ladbrokes Coral Group plc., has signed on as the first wagering operator to commit to using The Global Tote. Further to the announcement on 23 November 2016, the Board of TopBetta Holdings Limited (ASX:TBH) is pleased to announce that it has completed the issue and allotment of 15,000,000 fully paid ordinary shares to raise $3 million (before costs) at 20 cents per share from sophisticated and institutional investors. Topbetta Holdings Ltd (ASX:TBH) is pleased to announce that both Greyhound Racing Victoria and Racing Queensland have given approval for The Global Tote product. Topbetta Holdings Ltd (ASX:TBH) is pleased to announce that it has received firm commitments to raise $3 million (before costs) at 20 cents per share from sophisticated and institutional investors. Topbetta Holdings Ltd (ASX:TBH) is pleased to provide the CEO AGM Address at Annual General Meeting. Topbetta Holdings Ltd (ASX:TBH) is pleased to announce its subsidiary, The Global Tote Limited, is set to launch the new "wholesale only" tote product - &apos;The Global Tote&apos;. Racing Victoria has today granted approval for The Global Tote in respect of Victorian thoroughbred racing. Canberra Racing Club has also granted approval for ACT thoroughbred, harness and greyhound racing. The Board of TopBetta Holdings Limited (ASX:TBH) is pleased to provide shareholders with an update on the Company&apos;s activities for the end of the September quarter. The Board of TopBetta Holdings Limited (ASX:TBH) is pleased to announce that TopBetta&apos;s subsidiary, The Global Tote Limited, has been granted a Category2 (B2B) eGambling licence from the Alderney Gambling Control Commission. The directors present their report, together with the financial statements, on the consolidated entity consisting of Topbetta Holdings Ltd (ASX:TBH) and the entities it controlled at the end of, or during, the year ended 30 June 2016. The Board of TopBetta Holdings Limited (ASX:TBH) is pleased to announce that it has received firm commitments to raise $2.6 million (before costs) from global and domestic sophisticated and institutional investors ("Placement"). 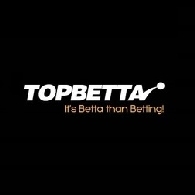 The Board of TopBetta Holdings Limited (ASX:TBH) ("TopBetta" or "the Company") is pleased to announce that, through its subsidiary, TopBetta Pty Ltd, it has been granted a licence in the Northern Territory by the Northern Territory Racing Commission to conduct business as a sports bookmaker. 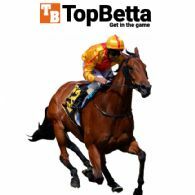 Topbetta Holdings Ltd (ASX:TBH) is one of Australia&apos;s fastest growing wagering sites. Achieving over 400% growth in the past 12 months including 88% growth in the past quarter alone, it looks set to become entrenched in the wagering industry both here and abroad. The Board of TopBetta Holdings Limited (ASX:TBH) is pleased to provide shareholders with the attached Appendix 4C for the quarter ended 30 June 2016. The Board of TopBetta Holdings Limited (ASX:TBH) is pleased to provide shareholders with an update on the Company&apos;s activities during the period from July 2015 to June 2016. Online fantasy wagering and sports content provider TopBetta Holdings Limited (ASX:TBH) is pleased to announce that it has partnered with digital horse racing media business G1X.com.au to provide G1X with its own fantasy wagering products and promotions.